This article is adapted and reprinted with permission from Beyond the Horizon: The Near Future of International Education. Launched at the 2016 NAFSA conference in Denver, Beyond the Horizon is a special anthology of essays and commentary from leading practitioners on the issues that will shape international education over the next several years. The complete edition is available to download now. Is it possible to manage and mitigate the risks inherent in international education in a meaningful way? Best practice, now quite common in higher education institutions in the UK and Australia, is to capture issues by maintaining a risk register, which is essentially an action plan arising from the assessment of the institution’s risk tolerance. A risk register is a catalogue of identified risks and an analysis of their probability and impact. Importantly, a risk register also includes options and plans for mitigating these risks. In uncertain markets where the risks of getting it wrong are ever-present, building a risk map is like ensuring you know where the electricity cables run through your house, and how to flip the switches when needed. Potential risks are legion. For example, a change to a scholarship programme or a decision to visit (or not visit) a particular country can change international student applications or their timing. How an agent or staff member represents the institution at an international event can impact the school’s reputation. An institutional policy or service change can dramatically impact retention rates. Changes to oil prices affect the number of international students able to apply from a given country. Issues of fraud or corruption are another contemporary risk. Plotting these issues on a risk register provides confidence that the issue has been considered and that the range of possible responses has been thought through – all of which means less drama and a problem more likely to be solved quickly and effectively. It’s important to note that risk is not “bad” per se. The key is to ensure that activity aligns with risk tolerance or appetite. Institutions that are risk averse may not be comfortable with suddenly adopting highly risky behaviours, such as opening offshore campuses. Institutions that are seeking a “first-mover” advantage in new markets, for example, need to be highly adaptable and creative, and a risk register can be an important tool in ensuring that systems and procedures within the institution back up this creative approach. Finally, by assessing the possible/potential impact of such a risk occurring. This generates an understanding of the types of risks to which the institution is exposed, and the risk level evident in the international student recruitment and marketing strategy. An institution’s exposure to these risk types will vary by market, so it is a useful practice to maintain a risk profile and risk register for the overall institutional strategy, for the international enrolment programme, and for each major market or specific initiative. Once risks are identified and the profile is mapped, actions can be planned that will mitigate the risk and ensure a greater chance of achieving strategic goals. Managing external risk is all about understanding the environment in which institutions seek to increase and diversify international student enrolments. Scenario planning is a tool that can help institutions gain greater insight into complex, sometimes unrelated issues that have the potential to significantly impact international student recruitment. 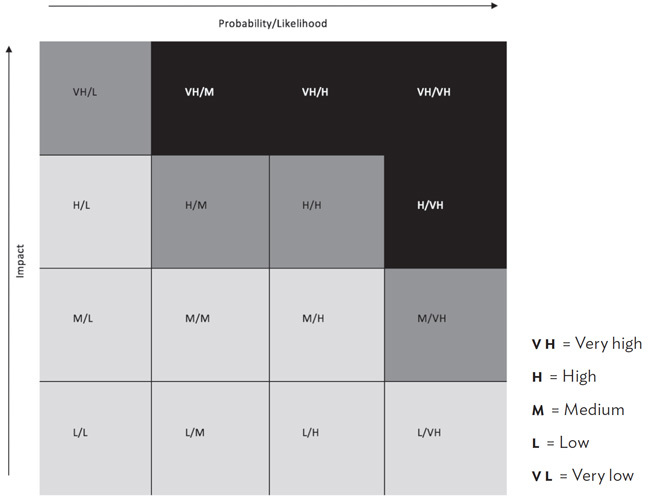 Conducting imaginative exercises in scenario planning can help an institution deliberate possible futures and consider how it might respond to the driving forces of change. In international education, topics might include the impact of technological change, the move toward structured programmes (such as pathways and TNE), and possible tectonic shifts in student mobility. Scenario planning operates on an assumption that predicting the future based on what we know and experience now is at best unhelpful as a guide to the future – and at worst, is dangerous as a guide to action. As the landscape of global student mobility changes, the nature of the competitive environment shifts. Education institutions in an expanded number of countries are seeking to enrol international students in their programmes, either in the home country of the institution or of the student. The competition for the best students is no longer a competition between similar institutions in a single country for students directly recruited to the host country. Students can choose from an array of programmes in different countries, of different duration, cost, quality, delivery methodology, and qualification type. Doing nothing is almost as risky as doing something. In an environment where almost every institution seeks to be “global” and where almost every institution’s vision document mentions international, it is unlikely that many institutions will do nothing at all. But those that include a strategic assessment of risk will add a valuable dimension to their international strategy and its successful implementation. This entry was posted in Uncategorized and tagged risk management, risk management programmes, risk management strategy, .